Welcome to the Celebrate Your Unique Talent Day Blog Hop! Make sure you comment on every blog on the hop because one lucky winner will be chosen from all the comments! The winner will get their choice of an Original or Mini MISTI! Get commenting!!! I think it is a true talent (and takes a smart cookie!) to come up with of an idea for a fabulous unique product and follow through and create that product and bring it to market. That is exactly what Iliana Myska did with the MISTI stamp positioner and creating her company My Sweet Petunia. Having an idea is the easy part. Running with it, creating prototypes, figuring out manufacturing and marketing and then there is the patent process. Whoa! Not many people can say they invented and produced a product. The MISTI has change how I stamp and I use it on every single project I make. I’m so proud that Uniquely Talented Iliana Myska is my friend. She has accomplished so much. 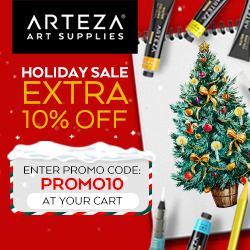 Have you been waiting for a MISTI sale? This entry was posted in All Occasion, IO Inks, MISTI Tool, Stampin' Up!. Bookmark the permalink. Perfect sentiment for this focal image. Love the background as well. Very nice — and a nice tribute to the inventor of the MISTI!!! Love the card, Jeanne and love your new color for the MISTI!! 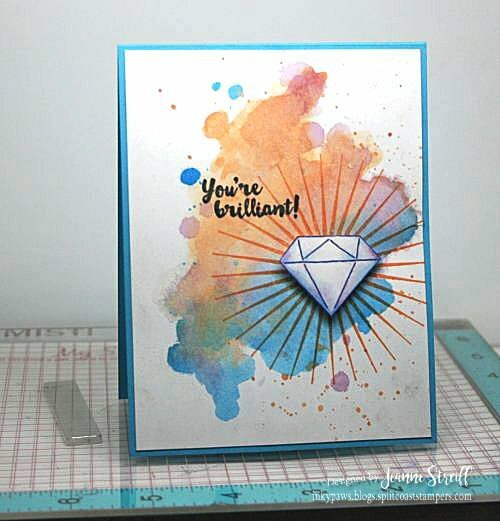 Awesome color combo on your pretty card! Ilina is indeed a smart cookie! I love all of the colors in your card!! A fun looking card. very creative. Jeanne this is a wonderful card. Love the blended background colors.. so Brilliant! Love the sentiment. and 100% agree Iliana has indeed changed the stamping world for the better. Beautiful card. I love my MISTI – it has definitely changed the way I create cards. Your card is fabulous, Jeanne! I love how colorful and unique it is! Thank you for honoring Iliana today. I had pretty much stopped stamping until the Misti came along. Too much frustration for this perfectionist! But now I stamp nearly every day, with the help of my Misti. Yes, I agree, Iliana is brilliant ! 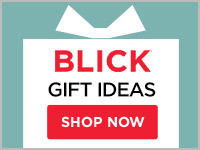 As is your card, colorful and brilliant ! Beautiful design! Love all the colors and, of course, the sparkly diamond! 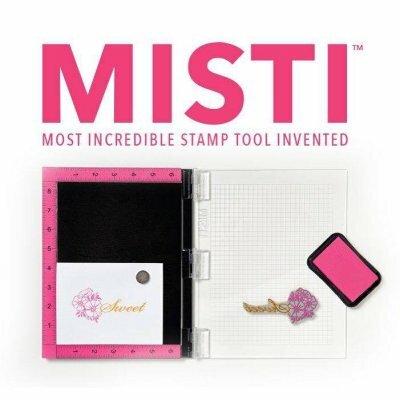 I can’t imagine making a card, a tag, or anything else using a stamp without a MISTI. Great card! Perfect card for Iliana! Her MISTI creation was brilliant! This is a beautiful card. I love the brilliant colors. What and cool card! And thanks for the info that I️ can Chan the color of my MISTI! Wow! Gorgeous card!!! Beautiful colors!!! Colorful, cheery, spot on card. Very nice tribute! I like the background of your brilliant card design. That is the perfect sentiment for this occasion. Very pretty. Awesome idea that turned out beautifully! Can’t wait to try this with my Misti. Thanks for posting such a great card. I love this – that gem in the center is a great idea! So very pretty! I need a Misti! Very pretty indeed. I love the MISTI and I love your card! What a Beautiful Card and great way to celebrate Iliana for creating the MISTI which I LOVE!